Ok, so this bento looks and tastes almost exactly like yesterday's bento, but that's cool, because it was tasty and I didn't have to cook anything! More yummy treats from Fresh by Lisa Hemenway (chicken salad and roasted beets), plus a few carrots, cuke slices, and a tiny cherry tomato from Ridgeview Farms. I really love the container, which I found at Daiso in Westlake Mall on my recent trip to Seattle. 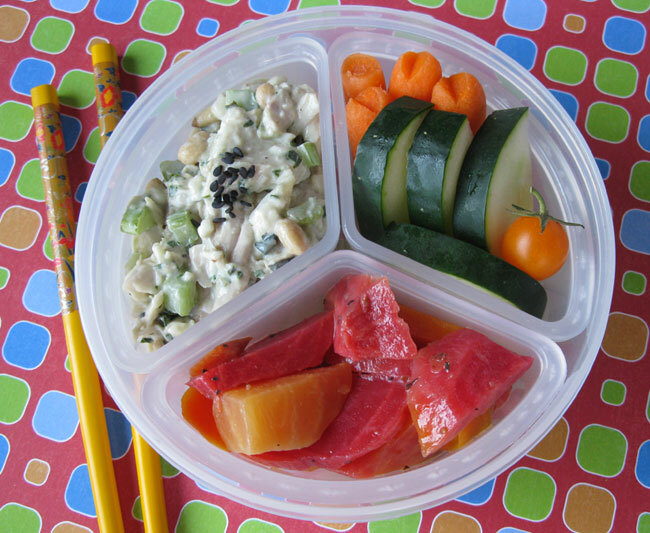 It's a Magic Round Bento with compartments! Double woot. 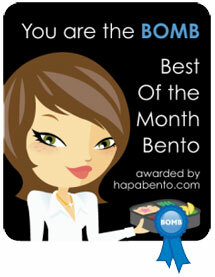 I wanted to share a couple of exciting tidbits: the Sonoma Bento blog made it to 10,000 hits this past week and to celebrate I am going to do another GIVEAWAY! Woohoo! 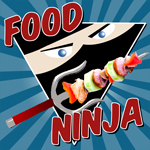 Stay tuned bento buddies, I am pretty sure I will have it ready to go by this weekend, or Monday at the latest. Also, my friend Maria Vieages, a fabulous chef and host of Maria's Non Pompous Food Talk has asked me to be on her show to talk about bentos! Yay! I am scheduled to be on the show this coming Monday, October 4th. You can stream her show Mondays from noon to 1pm online at kggvfm.org. Just click on the link that says STREAMING LINK. Plus, if you have any topics you think I should cover, let me know. I really hope that I can get more people excited about bento making. And lastly, my hubby just started a new job (yay) and now I am making non cute bento boxes for him. So far it has just been sandwiches and veggies, but I am going to get all creative soon. Yay! That's so exciting! I can't wait to listen to the show :) I am also totally envious of the round bento! I have to get one of those. Lol! Round bentos are the BOMB! If I can work it out, I will get a copy of the show and try to post it here. Yay Michelle! Can't wait to listen in. Cool round box, and grats to Mr. Sonoma Bento too! Some people have told me recently they're reluctant to start making bento because the thought of RT food sounds unappetizing to them. Maybe some ideas for RT-friendly meals? Like your delish salad today! Thanks sheri! I definitely will talk about room temperature bento friendly food. My hubby takes an ice pack with his sandwich since he is in a hot truck all day. Thanks Debra! I had a blast at the Daiso in Westlake. Some really crazy stuff there. Another radio talks...wow, you rock, Michelle! Thanks Yenny! I have the best job ever! Hi Lia! I am in the Pacific Time Zone. The show will be from 12 noon to 1pm. I hope I can get a copy of it so that I can post it here. Yummy bento and I love the box! I'm going to have to find me one of those beauties! Look really tasty and I love the box too! Thanks Kelly! I just saw your giveaway and I can't wait to enter. Cool stuff!